Getting organized seems to be the theme in January each year. After the resolutions have been made, it seems to be the time when people clean out closets and label everything in their houses. I am no exception. I like to think that I am fairly organized all year, but I will admit, I catch the January bug too. This year, my first order of business was getting my home office that is also my craft room organized. You can see how it all went down here. One of my favorite parts about my newly organized home office, is my curvy framed chalkboard. I love that I can have my blog goals written down so that I can see them and remember just what I want to be doing this year. I also love that the chalkboard is vinyl! I didn’t have to paint anything and I can use chalk markers instead of having chalk dust everywhere! 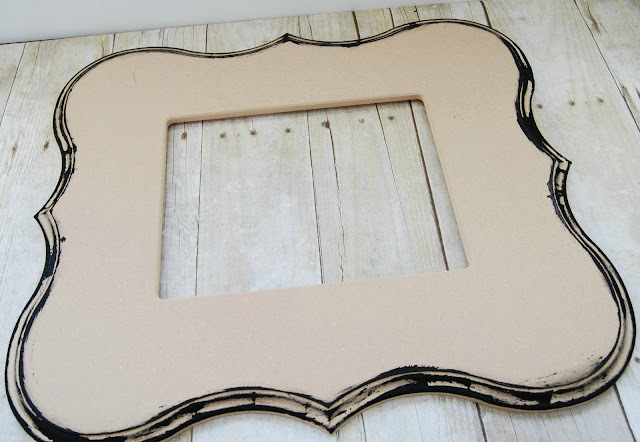 Making this is chalkboard is easy! First, you want to paint the edges of your frame the color that you want to pop out from underneath your main frame color. 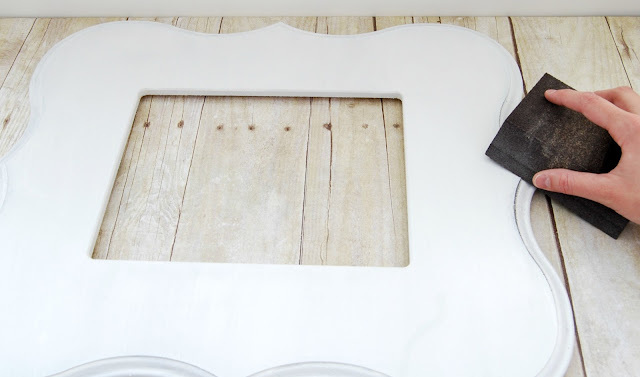 The painted edges don’t need to be perfect, just get a little paint on all of the edges. I chose to paint mine black so that when the rest of my frame is white, the black will help accent the curvy edges. 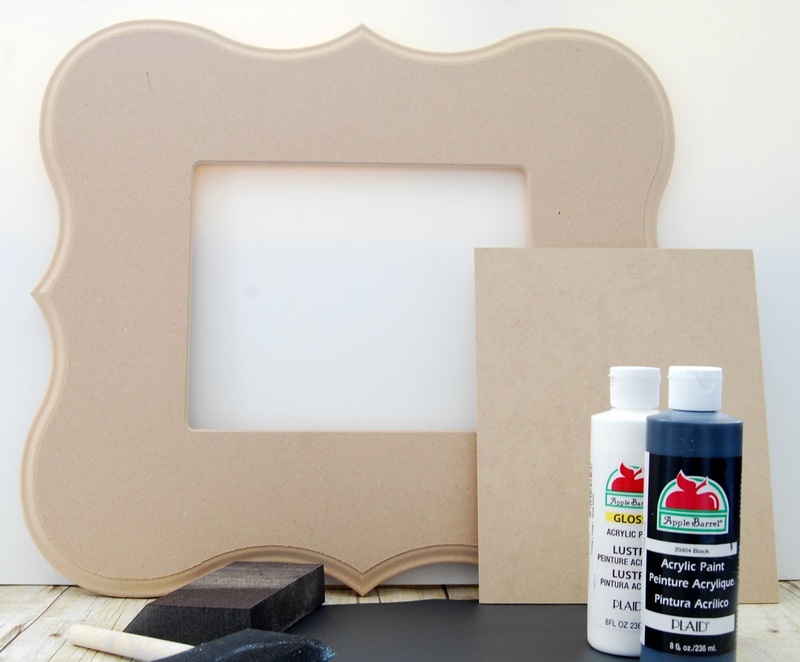 Paint the entire frame the main color you want it to be. Be sure to paint over your already painted edges. After your paint has dried, go back over the edges of your frame with sandpaper. Sand off the main color so that your painted edges will pop through. Measure the backing of the frame where the picture would be. Cut your peel and stick chalkboard vinyl out to be the same size as the back of the frame. 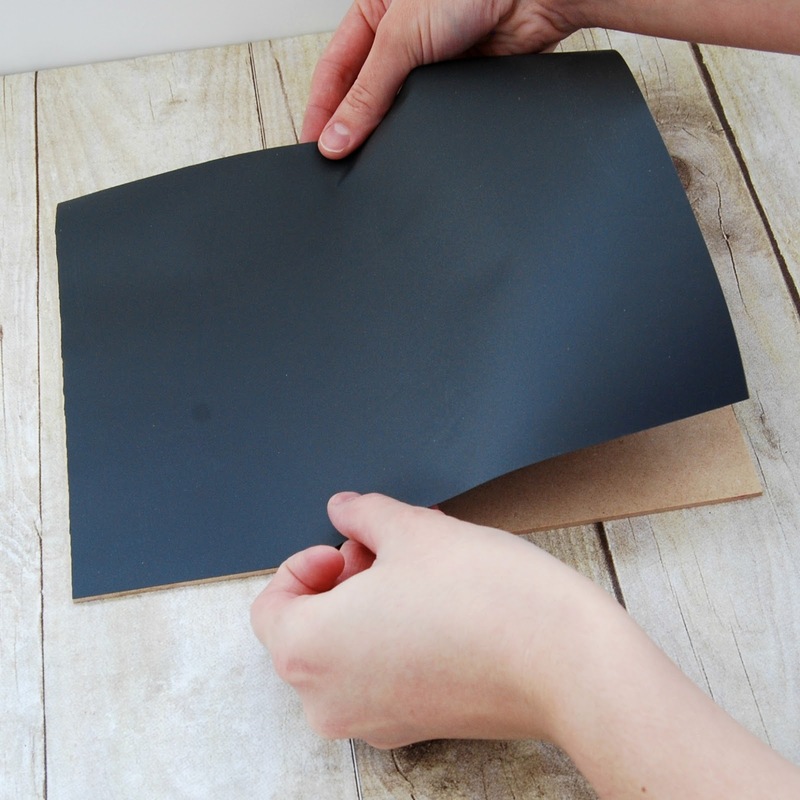 Peel the chalkboard vinyl off of the backing and stick it onto the part that would be behind your picture normally. Use a credit card to get any bubbles out of the vinyl. Put the backing in the frame. These frames don’t have the little pieces that hold this part onto the frame, so I just taped mine on with duct tape behind the frame. I hung mine up using the Command picture hanging strips. If you are a long time reader, or even a not so long time reader, you know how much I adore those things. They are so easy to use, and I didn’t have to damage the wall. Is organizing part of your new year’s resolutions? Love this! And, organizing is definitely part of my New Year’s plans. I have coveted this since you posted your room! I already have the vinyl….now to get my hands on that curvy frame!!!! I have coveted this since you posted it! I already have the vinyl….now to get my hands on that curvy frame!! 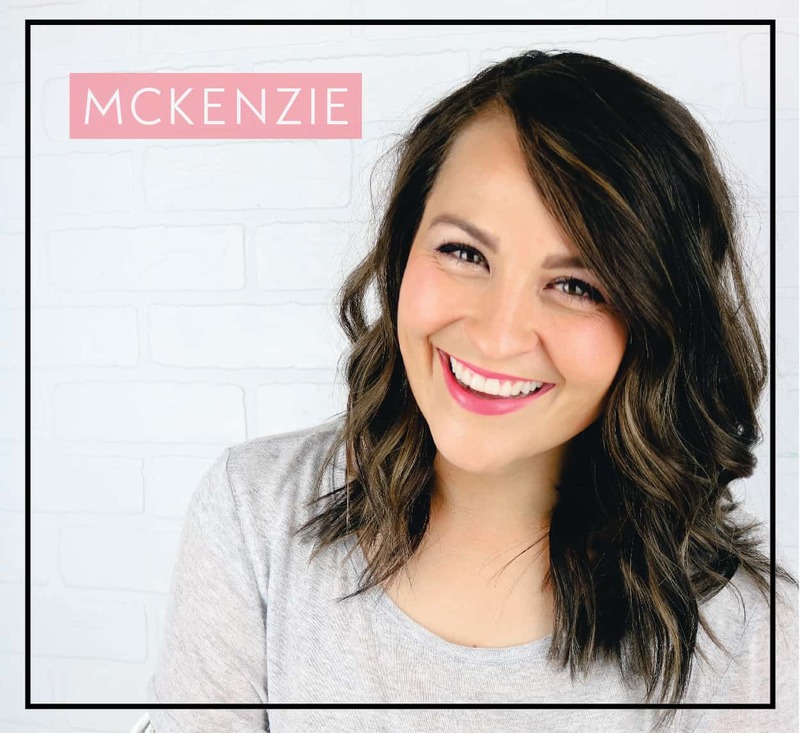 Found you on Lil’ Luna’s link party and I’d love for you to come link this up at my Tuesday Time Out that is still open! I love it! P.S. You can guest post on my blog ANYTIME! This is supre neat… definately going to try and make one of these this week. My goal for January was to clean/organize my office which is my craft room too. This is adorable! 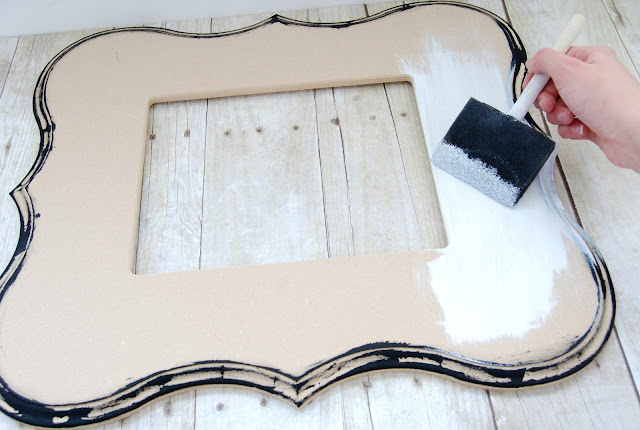 I’ve never thought about painted just the edges with a dark paint so that when you distress it shows through! Super cute! 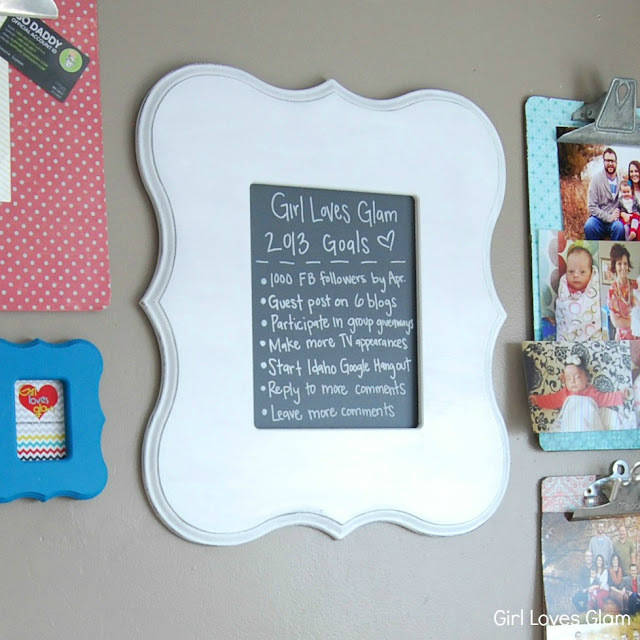 love your frame and great goals!! Love this project. thanks for sharing. found you on Craft-o-Maniac Monday. 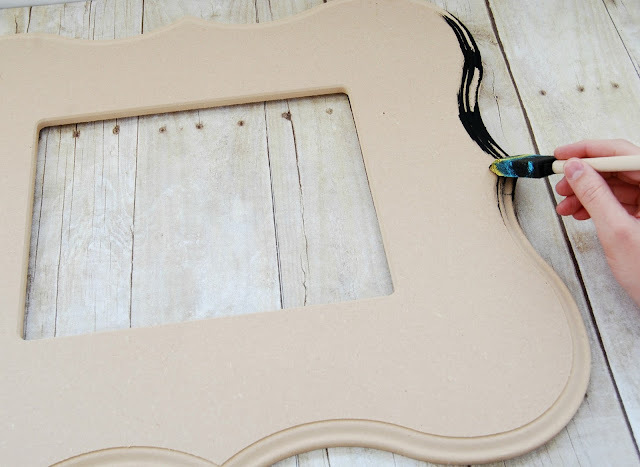 I have a few of these frames waiting for me to do something with them – thanks for the inspiration! Thanks so much for linking up over at Finding the Pretty & Delicious Link Party. Hope you’ll join in again this Saturday!